Editor's note: This article was written by an industry professional and guest contributor. The views and opinions in this article are of the author and do not necessarily reflect the views of PInow. When asked to write an article about myself the first thing I did was ask myself a question: where do I start? Let’s first start with my background. I have over seventeen years in doing research and skip tracing. I was the go-to person for tracking down those who didn’t want to be tracked down. I mostly did my skip tracing for collection agencies. I then spent seven-years investigating businesses and corporations doing research and skip tracing on the owners and any other parties involved. After that, I decided it was time for a change. I had some health problems and needed to take some time off for recovery. During this time I went back to college and decided I would get a degree in Paralegal Studies. So, two and half years later I graduated from Pima Community College in Tucson, Arizona. I graduated with the highest honors Phi Theta Kappa. While I was in school, I volunteered and worked at the Pima County Attorney’s Office (PCAO). I spent the majority of my time in the Special Victims Unit. My special circumstances help with surveillance because no one suspects that I am a PI and I can pretty much go up to my subject and film them and they don’t suspect a thing. Before I graduated I decided I needed to make a decision: what was I going to do? Since I was almost done with school I needed to decide where I was going to work. At first, I was thinking about working full-time with PCAO. However, during final summer classes I decided I would rather work for myself than someone else, I figured this was the best time in my life to start my own business. So, before I decided to take this venture, I talked with a good friend from school, Harvey Morris, who has owned several successful businesses. It was during one of our several conversations that we both felt with our background and schooling--he was also in the paralegal program with me--that a private investigators business would be perfect. Several months later it was decided that I would start the business alone, with my friend giving me free consulting. I was nervous, scared, and excited all-in-one, but ready to take this plunge. This takes us up to the summer of 2012. I started the paperwork needed to get my business license, my EIN, and, of course, my license. 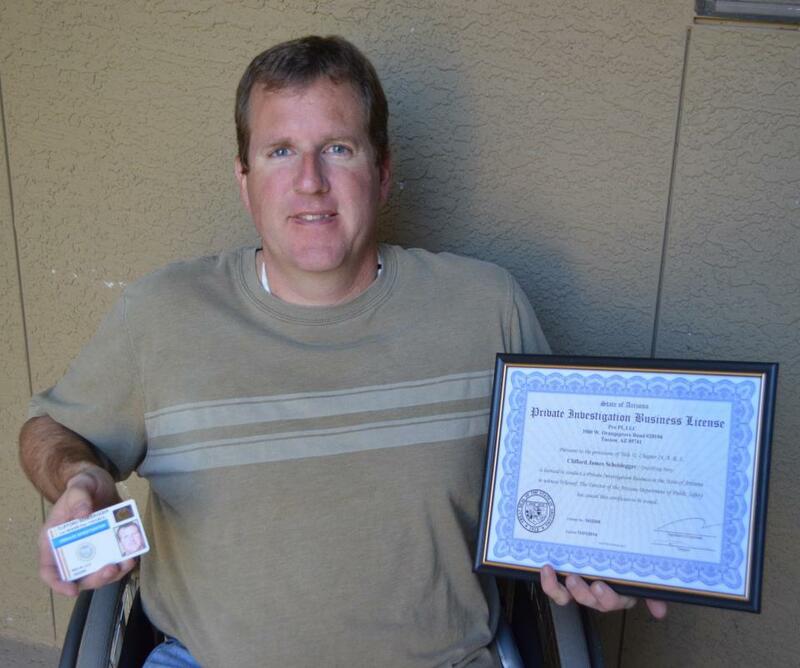 By October 2012 I had my approval for my license and all the necessary paperwork to be in business. Since getting things going, I have decided that my specialties are research, skip tracing, and surveillance. I have found that with my special circumstances, surveillance has been quite easy. Well, I was asked to write this article and tell you about me “The Unlikely PI.” Why am I the Unlikely PI; well I was born with Spinal Bifida. For those that don’t know what that is, it’s a birth defect that affects the spinal cord. Each case is different, but in my case, I can’t walk. I use crutches only to put my wheelchair in the back of my vehicle and to get up to the driver seat. I have hand controls so I can drive and use a wheelchair to get from point A to point B. My background has helped me go into the PI industry, especially when it comes to doing research and skip tracing. I have even had other PIs in North Carolina turn to me to help. Now since I am a new company, things are still a little slow, but I am enjoying my new found career. The one thing I want any reader to understand is the fact to never judge someone from their cover. Just because someone may be in a wheelchair, doesn’t mean they can’t do the job necessary. “The Unlikely PI,” is a segment that I created on YouTube. I created for two main reasons. The first one, of course, is to try and generate activity to my website and the second one is to bring to light some issues that those of us that are handicapped deal with on a daily basis. I did this because a lot of people try to be cognitive about the disable, however, they offer help in areas that most of the time we don’t need it. These same people then go and do something that hinders or makes things harder for us. Don’t you fear for your safety? Well, I think at any point that any PI fears for their safety. This industry can be dangerous at times and I would be lying if I said that there was never a time that I have felt fear doing my job. It’s because of the dangers that this job has that I do carry a concealed weapon and continue to make sure I go to the range regularly to make sure I am prepared to use it. What if you have to protect yourself from someone trying attack you? This question is similar to the one above, however, it differs. People often look at those that are disabled as helpless, so it is not surprising that they think that we can't take care of ourselves. With this said, we are thankful when the public offers assistance, but understand, the majority of us can drive, go grocery shopping, open doors, and if need be we can protect ourselves. I have taken karate classes and if someone does try to attack me, I can fend for myself. With this said, I hope to not be in that position and never have to pull my gun. However, if I have to, I am not afraid to fight or use my weapon. When I decided to start my own business as a PI, in a sense I was finally living out my dream job. This question is one I never know how to answer. Why does one end up doing what they do? Some people just love what they do and do it. Others, like me, just fall into it. Becoming a private investigator in some ways was always a childhood dream. We all grew up watching or reading about a famous PI. As for me, there was Magnum PI and of course the famous Sherlock Holmes. So when I decided to start my own business as a PI, in a sense I was finally living out my dream job. One of the most asked questions that I am asked, why would I need a private investigator? Most of the general public considers the PI the guy lurking in the dark spying on a possible infidelity case. Yes, some of us PIs do follow the possible cheating spouse. However, there is a lot more we can offer the general public. We can investigate a child custody case, where we can follow and watch the actions of the other spouse with the children. Maybe you think that a spouse or someone that spends time around your children may be doing something wrong; we can watch and document the actions of that person. PIs are a big help in missing children cases. In child custody or where they may be a civil judgment, a PI can follow a subject to find out and document where that subject is working. Say, maybe you need a long lost family member or school friend found, a PI can be of great help in a case like this; I had a case where a person had a stepbrother growing up, lost contact because of a divorce, and my client wanted to reach out and make contact with the stepbrother. I was able to use the information they had and make that happen. I guess my point is that there is a lot that we can do to assist the general public when and where it's needed. We don't just sit in the dark watching cheating spouses, and even though those cases can be interesting at times, mostly it is boring. For more information, feel free to call me or check out the two completed videos on YouTube under “The Unlikely PI.” Thank you. C.J. Scheidegger is the Owner and Lead Investigator with Pro PI, LLC, serving Tucson, AZ, and the surrounding cities, even the Phoenix area. Pro PI, LLC specializes in research, skip tracing and surveillance. They also do background checks and any other needs you may have.